WHEN A REGULAR BIRTHDAY PARTY… ISN’T ENOUGH. Looking for somewhere to host your next birthday party or special event? With up to 14 VR Stations, a wide variety of content and a private party room available for post-play celebrations, your next party is bound to be unforgettable! * plus TAX. Includes 10 VR Stations for one hour followed by 40 minutes in the Party Room. Planning a birthday celebration? VR is always better with friends! 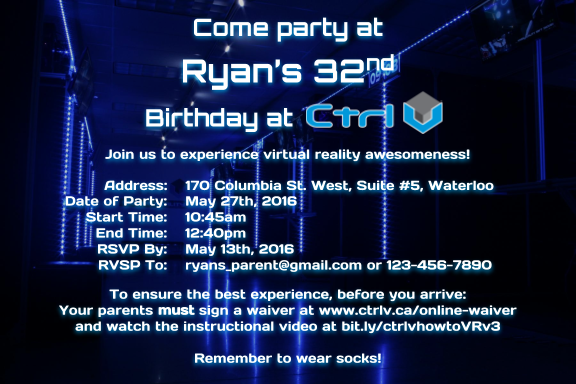 Let Ctrl V help host your party! Amazing, immersive visuals and 360 degree sound will launch your guests into virtual worlds more realistic than anything you can imagine. Our VR experiences are perfect for anyone ages eight (8) and up, and our game library has a range of content to cater to every individual’s preferences. Our facility is wheelchair accessible and so is our VR technology. The guests will play VR for one hour and can switch in and out of any games in our library at their discretion throughout the session. If you book 10 or more VR Stations, you can also add the Party Room to your booking for the 40 minutes following VR. The Party Room includes tables, tablecloths, a full-sized refrigerator with freezer and enough seating for up to 15 guests. You are welcome to bring your own food, drink and dinnerware. After completing and paying for your birthday party package, complete the adjacent form and we will send you personalized birthday invitation PDF file within 48 hours.